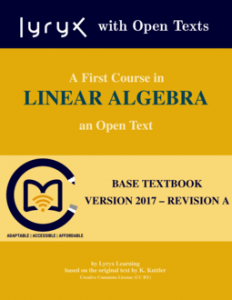 This open textbook, originally by K. Kuttler, has been redesigned by the Lyryx editorial team as a first course for the general students who have an understanding of basic high school algebra and intend to be users of linear algebra methods in their profession, from business & economics to science students. All major topics of linear algebra are available in detail, as well as justifications of important results. In addition, connections to topics covered in advanced courses are introduced. The textbook is designed in a modular fashion to maximize flexibility and facilitate adaptation to a given course outline and student profile. Each chapter begins with a list of student learning outcomes, and examples and diagrams are given throughout the text to reinforce ideas and provide guidance on how to approach various problems. Suggested exercises are included at the end of each section, with selected answers at the end of the textbook. Openness Comments: The TeX source may be available from Lyryx Learning. Notes: Slides and online homework are available from Lyryx Learning.